…an accidental consequence if we’re not careful and we irresponsibly let Tsipras blindly lead us into this trap….when SHAKING UP EUROPE IS PRECISELY THE POINT!!! Sunday’s elections in Greece could bring to power a party that’s pitting the debt-ridden south of Europe against the rich north. Can its leader’s charisma carry the day? In 2012, when Alexis Tsipras last ran to be prime minister of Greece, his compatriots were quite literally killing themselves in public squares because of the tough austerity measures that had strangled the country’s economy. Tsipras, just 37 years old at the time, personable, extremely telegenic, took a page from his playbook as a student activist to rabble-rouse for a better life. Tsipras’s office was adorned with a poster of Ernesto “Che” Guevera. (His youngest son is named Ernesto.) And he rarely wore a necktie—especially when he tooled around Athens on his German BMW motorcycle. Back then, Tsipras promised to guide Greece to a better future, which he proposed would be one without the single European currency and thus outside what’s called the Eurozone. In the end, Tsipras lost the election, which was played out in two rounds after no clear winner emerged from the first poll. But the fact that Syriza won 27 percent of the vote meant that more than a quarter of Greeks thought his plan had legs, and that worried mightily the powers that be Berlin and Brussels. Tsipras, who is back on the ballot on Sunday, has changed a lot since that last electoral run. Back then his partner was pregnant with little Ernesto. Now Tsipras spends more time carting his two kids around in the family sedan than joyriding on his beloved bike. He still isn’t photographed much in a tie, but his approach is far more tempered and moderate. This time he is running on a promise not to leave the eurozone. (He now calls his 2012 campaign promise a “paranoid plan.”) And this time, he might just win because many of the negative projections have come true and things in Greece have gotten worse. More than 200,000 Greeks have left the country in the last five years, and austerity has forced many businesses to shutter up or go off the radar. Greece’s black market economy is now estimated to account for nearly half of the country’s GDP. More than 200,000 Greeks have left the country in the last five years, and austerity has forced many businesses to shutter up or go off the radar. There are also signs that Europeans in other countries who once fought to keep the eurozone intact at any cost now feel they could get along pretty well without Greece. After all, it has a population of only 11 million in a European Union of 500 million and it represents only about 1.4 percent of the union’s GDP. In early January, Germany’s Der Spiegel weekly quoted a source close to German Chancellor Angela Merkel saying that Berlin was “open” to a Greek exit, or Grexit, as the potential departure move is known. Under pressure, Merkel was forced to backtrack, insisting unconvincingly that she wanted Greece to stay. “I as German chancellor, and also the German government, have always pursued a policy of Greece staying in the euro zone,” she said at a joint press conference with British prime minister David Cameron. This time around, Tsipras has promised the Greeks that Europe needs them and has no choice but to renegotiate Greece’s bailout debt conditions. And Greeks like what they hear. Days before the vote, he widened his lead by nearly 7 points ahead of current prime minister Antonis Samaras’ New Democracy party, according to the last poll conducted by Greek SKAI television. Last time, Tsipras came out swinging against Europe and its currency. This time he is picking his fights, and trying to build alliances across the southern tier of the continent. 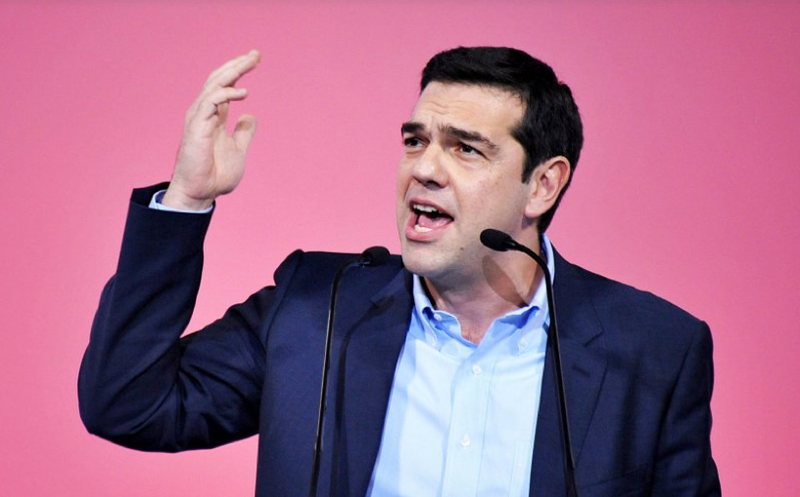 Tsipras argues that in order to stay in the eurozone, Greece’s ruling party has negotiated a foolhardy payment schedule for its $378 million bailout debt that makes it impossible for the country to grow. The current repayment plan is 175 percent of the gross domestic product, and Tsipras wants a better deal, starting with his demand that Europe should simply erase most of the Greek debt. The lessons the young leader has learned since the last elections are apparent. He has traded what amounted to fear-mongering in his last electoral campaign for consensus building, starting with a promise to some of his former naysayer European leaders. Many of Europe’s struggling countries have launched their own versions of alternative leftist Syriza parties and Tsipras had made the rounds to Italy, Spain and Portugal in recent months. In 2012, Tsipras gave wide ranging interviews to most people who cared enough to ask. This time around, he is writing op-eds in Europe’s largest newspapers to garner support not only for voting Greeks who have moved abroad, but to get Europe’s other austerity-suffering countries to back the debt reshuffling proposal with the idea that such a precedent could help them, too. Speaking to RTLZ television ahead of the Davos meetings, Dutch finance minister Jeroen Dijsselbloem, who heads the influential Eurogroup of European ministers agreed. “There’s no political support to write off Greek debt,” he said. And in Germany, there was that Der Spiegel report that the German government would rather have a Greek-free euro than open the way for a trend that would be costly to the richer nations. “The German government considers a euro zone exit [by Greece] to be almost inevitable if opposition leader Alexis Tsipras leads the government after the election and abandons budgetary ­discipline and does not repay the country’s debts,” the magazine reported. Even at home in Greece, not everyone predicts that Tsipras will walk away with a clear mandate to run the country. Alexis Papachelas, executive editor of Greece’s Ekathimerini newspaper, cautions that the likely scenario of a second vote, like what happened in 2012 when the first ballot failed to produce a winner, could spell even bigger disaster for the country. Tsipras’s response is typically stirring: “The struggle of our peoples for change is the struggle of common sense versus ideological fanaticism,” he says. “It is the struggle of dignity versus servitude,” he says. But at the end of the day, somebody’s got to pay the bills. Tags: Alexis Tsipras, European Union, Greece, SYRIZA.